Flight 19 the Lost Avengers - Naval Air Station Fort Lauderdale Museum Naval Air Station Fort Lauderdale, the only military Museum in Broward County, on the register of historic places. 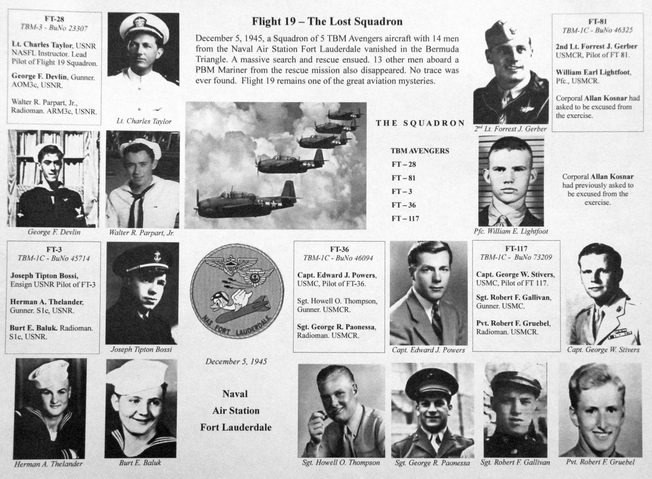 Flight 19 Disappearance: 5 December 1945, Fort Lauderdale, Florida. At about 2:10pm Eastern Standard Time. A warm day with billowing clouds soaring overhead in the current of a gusting southwest trade wind. The temperature was 67 degrees. The general weather conditions were considered average for training flights of this nature, except within showers. Flight 19 is mistakenly called "The Lost Patrol." It was not a patrol flight, it was a training flight. It was supposed to be a routine navigation exercise and mock bombing run: a squadron of five TBM Avenger torpedo bombers carrying 14 men were to fly to the Hen and Chickens shoals in the Bahamas, to practice dropping their torpedoes and then return to the Fort Lauderdale Naval Air Station. 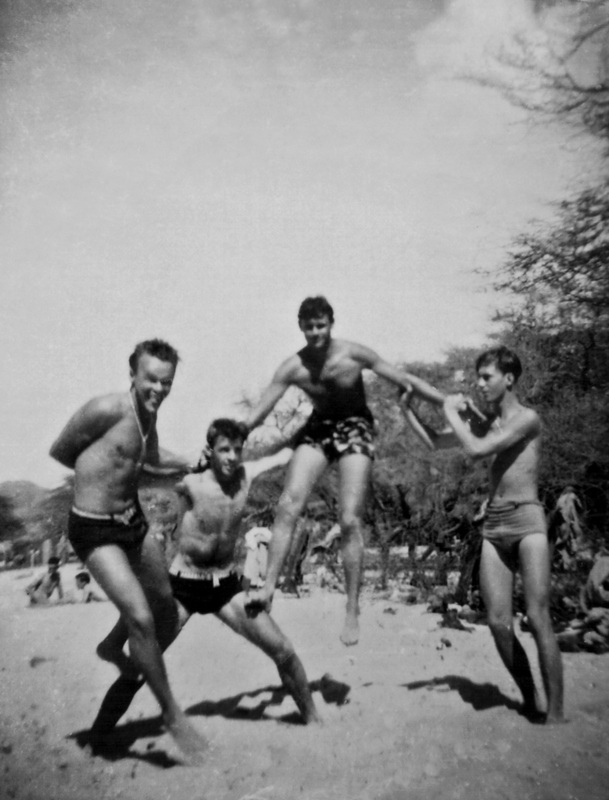 It was their last practice before graduation, and they had done this before (it was simply called Flight 19 as there were Flight 17, Flight 18, etc, training squadrons on that particular day). Flight 19 completed their assigned exercise and on their way back about 90 minutes after takeoff, the squadron commander Lt. Charles C. Taylor reported that he was lost. By this time, the weather and sea conditions got worse, as the evening wore on. Over the next three hours Lt. Taylor mistakenly led Flight 19 far out to sea, where the planes apparently ran out of fuel and crashed. That was on December 5, 1945, several months after the end of World War II. A massive search was launched for 5 lost planes, with units of the Navy, Army and Coast Guard to scour the sea for the lost NASFL Aircraft. Their disappearance launched one of the largest air and sea searches in history, and began the legend of the Bermuda Triangle. To this date, Flight 19 remains one of the great aviation mysteries. FT - 28 Flight Leader: NASFL Instructor, Lt. Charles Carroll Taylor, USNR. Aircraft: TBM-3D - BuNo 23307. FT - 36 Pilot: Capt. Edward Joseph Powers, USMC. Aircraft: TBM-1C - BuNo 46094. FT - 81 Pilot: 2nd Lt. Forrest James Gerber, USMCR. Aircraft: TBM-1C - BuNo 46325. FT- 3 Pilot: Ensign Joseph Tipton Bossi, USNR. Aircraft: TBM-1C - BuNo 45714. FT- 117 Pilot: Captain George William Stivers Jr., USMC. Aircraft: TBM-1C - BuNo 73209. Crew: Gunner Sgt. Robert Francis Gallivan, USMCR. Radioman: Pvt. Robert Peter Gruebel, USMCR. The squadron's flight plan was scheduled to take them due east from Naval Air Station Fort Lauderdale for 141 miles, north for 73 miles, and then back over a final 140-mile leg to complete the exercise. ​ Flight 19's location was last given as 75 miles northeast of Cocoa, Florida. At that time the planes had slightly more than one hour's fuel supply. They may actually have been as much as 200 miles at sea. Meanwhile, weather and sea conditions got worse, as the evening wore on. It was reported by the airport weather station at Miami, that a large area of turbulent air rolled out of a storm centered over Georgia, sweeping over Jacksonville about noon, and reaching Miami by nightfall. Squalls on the surface, 40 mile winds at 1,000 feet, and full hurricane of 75 miles an hour at 8,000 feet, was recorded at 4:00pm. There was a radio conversation that took place between flight leader Taylor and fellow Navy pilot Lt. Robert F. Cox, a Senior Flight Instructor who was in the air but not part of Flight 19. This conversation was uncovered in the Board of Investigation records. The last transmission from Flight 19 took place at 19:04 when Lt. Cox was on air communicating with Flight 19, until their signal got weaker. He wanted to search for the Squadron at this point, but was told not to, by NASFL officials who feared losing another pilot. An interesting note, is that the control tower officials at NAS Fort Lauderdale had a "ready plane" to search at the last transmission location, but they decided to ground all planes. At some point the crew tried to communicate between themselves: Ensign Bossi, and also Capt. Powers separately, tried to take control (Powers was higher in rank than the pilot leader, but still a student on the Avenger). They both communicated with the Squadron leader suggesting that they should be correcting their course. Captain Charles Taylor was initially found "guilty of mental aberration." Later on, his mother, Katherine Taylor, was successful in exonerating him of wrong-doing by filing her own investigation. 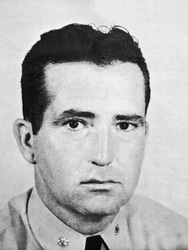 Lt. Charles Taylor was exonerated in 1947 by the Board for Correction of Naval Records, in regard for "responsibility for loss of lives and naval aircraft." The pilots' ultimate fate was never determined, nor was the fate of thirteen other men sent out to search for their lost colleagues. Within minutes of learning of the squadron's predicament, two PBM Mariner flying boats were dispatched from NAS Banana River in Melbourne, Florida (now Patrick Air Force Base), carrying rescue equipment. ​Less than a half hour after take-off (at approximately 19:27), one of the PBM's (Trainer 49) radioed the tower that they were nearing Flight 19's last assumed position. The rescue plane with a crew of 13 men was never heard from again. Theories abound on this loss. It is known that the S.S. Gaines Mills reported seeing an explosion at sea off New Smyrna beach at 7:50 pm, and what appeared "to be an airplane falling." This ship also observed a widespread oil slick, while it fruitlessly searched for survivors. The weather was becoming stormy by the end of the incident. This PBM-5 Mariner (BuNo 59225) "Trainer 49" flying boat was lost with 13 men during the rescue mission. The Mariner was sent from NAS Banana River. Photo researched by Flight 19 historian Andy Marocco. 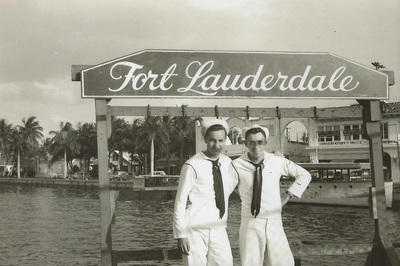 Image © Naval Air Station Fort Lauderdale Museum. Lt. David White, 4th from left to right, top row. Images © NAS Fort Lauderdale Museum. Flight 19 Complete Naval Report - Testimony & Exhibits: Get the naval investigation from original microfilm, published in book form (proceeds go to Museum). Born 1926 in Bloomfield, New Jersey. ​​and entered service soon after. Radioman on FT-3. He was 19 yrs old. Born in Brooklyn, New York in 1928. 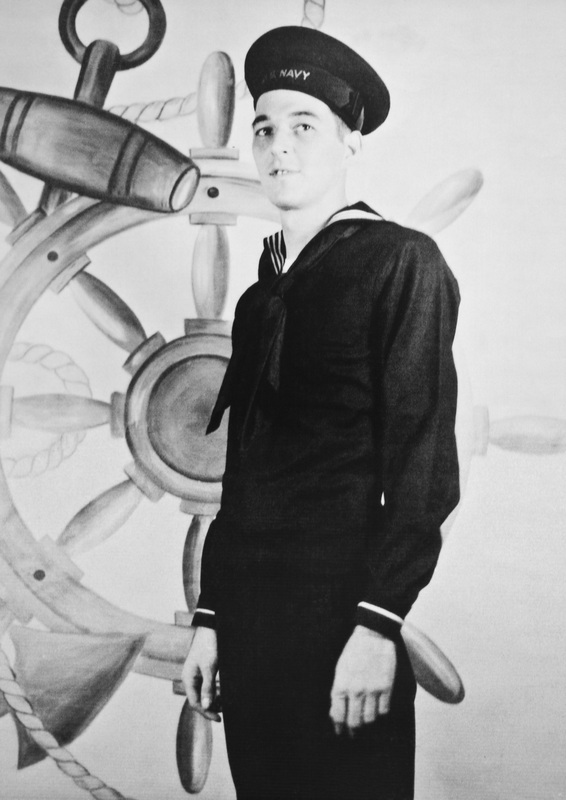 He was eager to help in the war effort and couldn't wait to be of age, so he decided to enlist in the United States Naval Reserve at the age of 15, under the alias of Robert F. Harmon. Trained at Barber's Point NAS Hawaii in 1944, and by March 1945 deployed to Guam and the fleet anchorage at Ulithi, where he reported on board the USS Enterprise. 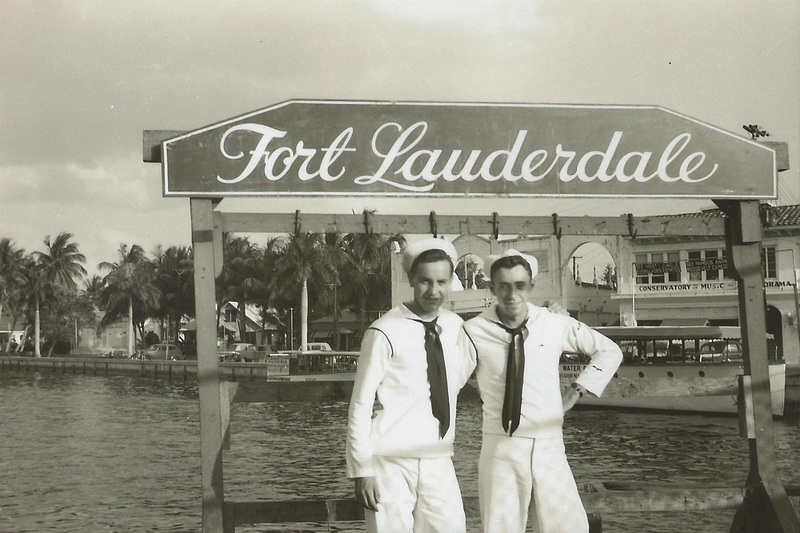 The war ended, and he made his way to Florida where he trained at NAS Fort Lauderdale. He was soon flying as a Gunner on the TBM/TBF Avenger Torpedo Bombers. At 17, he was in the process of having his alias changed to his birth name, when he disappeared with Flight 19. Gunner on FT-28. Born 1921 in New Ulm, Minnesota. 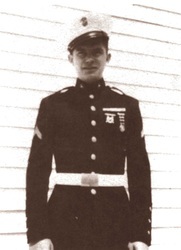 Served in the United States Marine Corps during World War II. and later an Officer in Training. Became an air cadet in 1944. ​ Had 360.6 hours of flight time, 61.8 on Avengers alone. He had received his gold wings 4 months earlier. Pilot of FT-81. He was 24 yrs old. Born in 1919, in Mount Vernon, New York. Graduated from Princeton University in 1941. ​for his desire to fly on the TBM/TBF Avenger torpedo bombers. ​Though a NASFL student, he was senior officer on flight 19. ​He was the only married man aboard, and the only father. ​and parachute were gone. A search and rescue was launched but nobody found anything. ​The cause of the gunner's disappearance is still unknown. Capt. Powers was Pilot of FT-36. He was 26 years old. Born October 25, 1917 in Nueces County, Texas. Taylor was a United States Naval Officer. He served in the United States Naval Reserve during World War II. 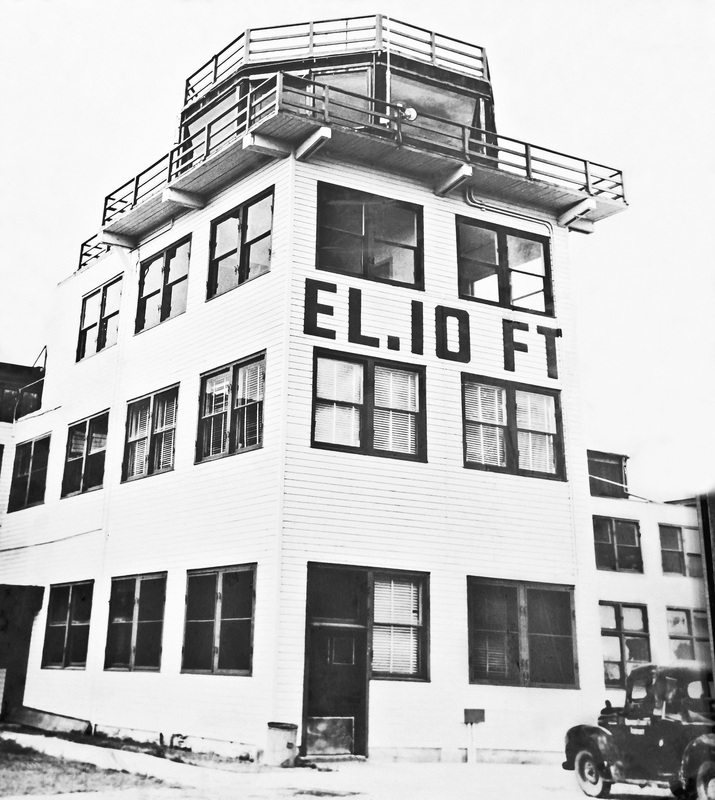 He graduated from NAS Corpus Christi, Texas, February 1942, and became a flight instructor October of that year. In 1943, he flew with Scouting Squadron 62 and later that year, he became a torpedo plane pilot with Squadron 7. From April to December 1944, he was aboard the USS Hancock as part of Task Force 38. Also part of Acorn 36 at NAS Miami Opa Locka, and Squadron 79. ​torpedo bombers. He was the commanding officer of Flight 19. Leader pilot in FT-28. He was 28 yrs old. Born 1925 in Chicago, Illinois. Became a Marine Corps Staff Sergeant. ​a Japanese dive bomber dropping two semi-armor-piercing bombs. to continue training. Gunner on FT-36. He was 20 yrs old. Born December 25, 1924 in Arkansas City, Kansas. He passed up a discharge so that he could stay in the Navy. Had 373.4 hours of flight time, 65.9 on Avengers alone. Pilot of FT-3. He was 20 yrs old. before his disappearance. ​Gunner on FT-117. He was 25 yrs old. Born in 1927 in Long Island, New York. Joined the Marines in 1944. Trained at Marine Corps Air Station in Eagle Mountain Lake, Texas. 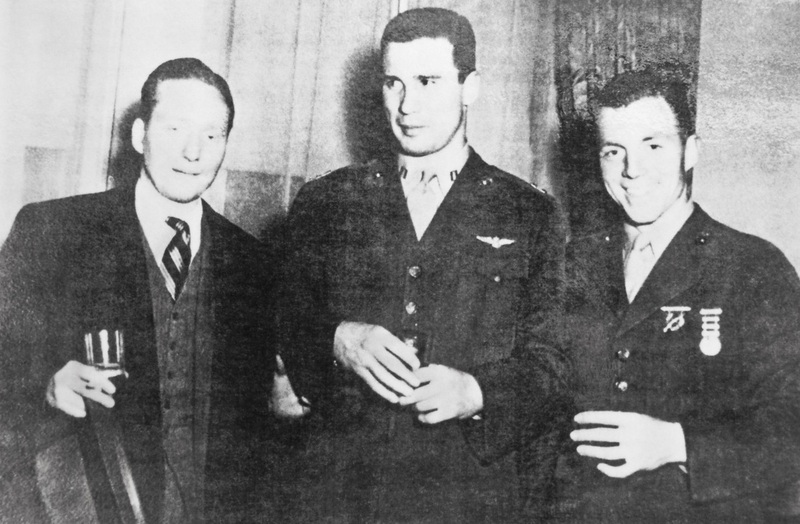 Here, he was part of the Marine Scout Bombing Squadron 931, with Marine Aircraft group 34. October of 1945 trained at NAS Miami, and by December, at NAS Fort Lauderdale training as Radioman/Bombardier aboard TBM/TBF Avenger torpedo bombers. Radioman on FT-117.​ He was 18 yrs old. Born December 1926 in Clayton, Union County, New Mexico. Entered the United States Marine Corps Reserve June of 1943. Trained in Lexington, Illinois. He was the only crewman besides the Pilot on FT-81. ​along with several original artifacts and photographs. ​days later reading "You have been misinformed about me. Am very much alive." Signed with his nickname “Georgie” (reportedly a hoax). Radioman on FT-36. He was 28 yrs old. Born 1927 in Brooklyn, New York. The NAS Fort Lauderdale Museum exhibits the log book he left behind. and Walter's parents. He was the Radioman on FT-28. He was 18 years old. Born April 1920, in Piedmont, Missouri. Graduated from the US Naval Academy in Annapolis, Maryland. 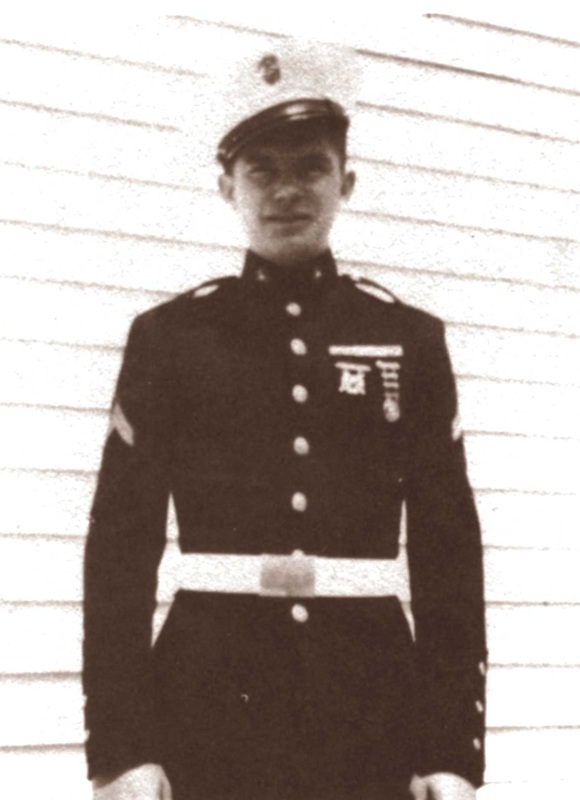 In 1942, as a fresh 2nd Lieutenant he was part of the Marine platoon in the 1st Raider Battalion, then part of the 3rd Raider Battalion in 1943. Then, during the Battle of Tarawa in 1943, George was General J. C. Smith's Aide de Camp, in the 2nd Marine Division. He was cited for gallantry, twice on Guadalcanal, and once on Tarawa. In 1944, he became an air cadet. ​NAS Fort Lauderdale, to train in the TBM/TBF Avenger torpedo bombers. ​He had 374.7 flight hours. He was Pilot on FT-117. He was 25 yrs old. ​Herman Arthur Thelander, S1c, USNR. ​for training several times: from September to November 1944, he was stationed at NAS Jacksonville, Florida. Then from April to June 1945 at NAS Fort Lauderdale, training on the TBM/TBF Avenger torpedo bombers. Gunner on FT-3. He was 19 yrs old. © Naval Air Station Fort Lauderdale Museum. In Oct. 18, 2005, US Rep. Clay Shaw, R-Fort Lauderdale, sponsored a bill in Congress (H. Resolution 500) honoring the 60th anniversary of Flight 19. Rep. Clay Shaw, member of the Ways and Means Committee, was the author of the resolution. With help from the NAS Fort Lauderdale Museum's collections, every year, several authors, documentary writers and producers do research on Flight 19: History Channel, Travel Channel, Discovery, the National Geographic, Sci-Fi Channel, NBC, Military Channel, the BBC, as well as others. The mystique and intrigue over what really happened to the airmen, has kept interest high about the men lost on that fateful day. The Mystery of Flight 19 helped popularize the legend of the so called Bermuda Triangle, the area between Fort Lauderdale, Bermuda, and Puerto Rico, where dozens of airplanes and boats have disappeared. Several colorful and far-out theories surround the planes' disappearance, including one where they were all abducted by extraterrestrials. Another theory asserts they wandered into a strong electromagnetic disturbance that interfered with their compasses. More practically, experts think that Taylor, the squadron leader, simply lost his bearings after his compasses failed. Believing he was over the Florida Keys, Taylor aimed the Squadron northeast, in hopes that would lead the single-engine bombers back to Fort Lauderdale. Instead, it led the Squadron out over the open Atlantic. To compound matters, the planes likely flew into stormy weather. Perhaps he realized his mistake and aimed the planes west toward Florida's coast, but only after it was too late. In 1989, Allan McElhiney and member Frank Hill were brought into the Everglades to investigate a TBM Avenger crash site which was revealed after a fire. This plane was determined not to be part of Flight 19 because the BuNo # didn't match. The wreckage parts are on exhibit at our Museum. An interesting account has been written by Flight 19 expert Jon F. Myhre a former Army pilot and aviation historian, with his book: Discovery of Flight 19. This book comprises his 30 year search for the Lost Squadron.